To close the Christmas season I have decided to do it with the recipe to make empanadas, another popular Christmas dish in Colombia, just like the buñuelos and natilla. And even though Colombians enjoy empanadas more during the month of December, they eat them throughout the year. The most famous in Colombia are the “church empanadas”. Each parish has a group of volunteers who prepare, cook and sell empanadas outside each church to raise funds. My grandmother proudly volunteered at one of these groups and she would always be seen happily selling her empanadas to donate her two cents. And just like each family has its own recipe to make buñuelos and natilla, the same thing happens with the recipe to make empanadas. Some make them with yellow corn meal, others with white corn meal, some make them with beef, others with chicken, with guiso (seasoned sauce), without guiso, with potato, without potato. But, they’re all very tasty. The trick is to season the whole empanada, from the dough all the way through the guiso in the filling. That way each bite is filled with that delicious Colombian flavor. What I do recommend is that you use the same corn meal that is used to make arepas. Peel and cut the potatoes into small cubes. Put them in a pot, cover them with enough water and add salt. Cook for about 20-25 minutes on medium heat or until soft. When the potatoes are cooked, drain them and roughly mash them. To make the dough, add hot water to a large bowl, add the chicken bouillon, Sazón Goya, salt and butter. Stir well to mix all of the ingredients. 4. Slowly add the cornmeal to the water and stir with a big spoon. When all of the corn meal has been added, work the dough with your hands until it becomes soft. Let rest for 20 minutes. Add oil to a large pan on medium heat. Add the garlic, red bell pepper, tomatoes, onion powder, salt, cilantro, and cumin. Cook this guiso (sauce) for about 5 minutes. 6. Add the beef to the guiso and cook it thoroughly. 7. Add the mashed potatoes and mix well to make the filling. 8. To make the empanadas, put a small ball of dough in the center of a tortilla press covered with plastic and press to flatten it. You can also put the small ball of dough between two pieces of plastic and flatten it with a small saucepan. 9. Add a tablespoon of the filling. Fold the circle of dough in half to form a half moon. this will prevent the filling from coming out during frying. 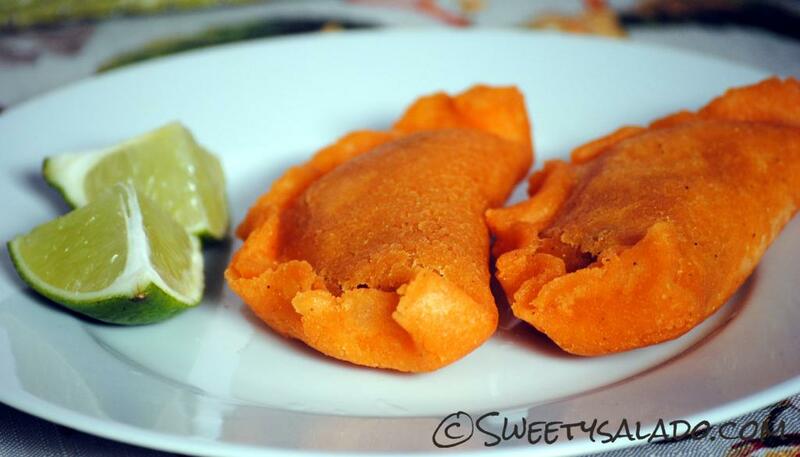 Once you have all of your empanadas ready, you can fry them in a deep frier with enough oil at 350ºF (180ºC). You can also fry them on the stove at medium high temperature. 12. Fry the empanadas for 6-7 minutes or until golden brown. Then put them on a paper towels to drain them. 13. Serve them hot with Colombian hot sauce and lime wedges. You made this look too easy to make. Thanks! Genial tu blog te felicito.Great Blog.Regardsolguis. 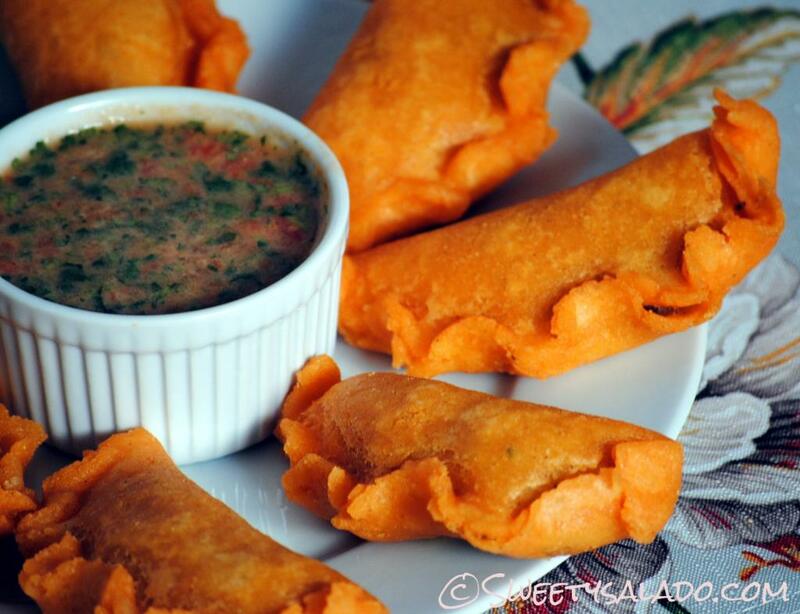 Can these empanadas be baked in the oven rather than fried? You have a fabulous blog – felicidades! I tried baking them. I placed the empanadas on parchment paper, set the oven at 375 degrees, and left them in for 15-20 minutes. They came out really crispy and a bit dry. I would suggest to lower the temperature to 350 degrees and brush a bit of oil on the empanadas. Keep a close eye on them. Me uno a sus seguidores. Hoy descubrì su blog, el cual, realmente està muy bien diseñado y sus recetas muy claras. Dan deseos de salir a cocinar rapidito. Really very very good. Looks delicious! Can't wait to make these!Are you able to share the Colombian hot sauce recipe pictured?Great blog and thanks! Thanks Olguita! Yes, the Colombian hot sauce is already available here on the blog, here's the link: https://www.sweetysalado.com/2013/01/colombian-hot-sauce.htmlI'm also posting a new hot sauce recipe this week, so stay tuned for that one as well.Thanks for visiting! Hello, what brand of cornmeal are you using in the video? I am not having the best luck getting the dough to come together. Thanks! Hi there! I usually use the brand PAN because I find that it is easier to work with. I also only use white corn meal because I think the yellow one is drier and has a synthetic flavor. My sister and my mom think I'm nuts because they think it tastes the same, but nah, I can tell the difference. Now, if your dough is too dry, start adding more water little by little until it's nice and smooth. If it's too wet, then add more corn meal instead, again, little by little until it's manageable. Do you use maseca for the empanada dough or regular traditional corn meal ? Thanks for sharing your recipe!! It looks super nice! I wanted to know for how long can you keep the dough…I am planning to invite friends at home, so to don't be rushingh, I'd love to prepare as much as I can the day before!Congrats for the blog!! Thank you very much! If you want you can keep the dough in the fridge for a couple of days and make sure you cover it well. Also, when you knead it again before you assemble the empanadas, make sure you add a little bit of water because it will be dry and then your empanadas will have cracks in them. Hello there… I was wondering can you use regular flour? or does it have to be corn meal?thank you! There are many versions of empanadas in Latin America, but to make these you need precooked cornmeal. I have heard a few people say that they use "Maseca" which is the corn flour used to make Mexican tortillas, but I haven't made them with it so I can't guarantee getting good results with it. Hola! I wanted to tell you that I absolutely LOVE your website. Thank you for sharing your delicious recipes!! My husband is Colombian. I made the empanadas last week and my mother-in-law swore that I store bought them and was passing them as my own. Which only meant that they were great! She made delicious empanadas and refuses to share the recipe with me. Gracias por compartir con nosotros! Hey, I really really want to make this, but there are no masarepa (or pre-cooked corn meal) to be found in my place, only corn meal. Would you be so kindly to tell us how to make masarepa from corn meal? I search on the internet but it just vague without specific recipe, I mean like how cook is pre-cooked and etc, thanks. Hi Nina, the only way to make this dough from scratch is by using hominy, not actual cornmeal. If you can get canned hominy at your local grocery store you can then grind it into a dough. Hominy is used in pozole which is a very popular Mexican soup so a lot of grocery stores sell it. Another way to make it is by buying the dry hominy corn, cooking it and then grinding it. I may do a video on how to make this kind of masa from scratch because a few people have told me that they can't get the pre-cooked corn meal. That would be great. But are you sure it's hominy, as in nixtamalized corn? Hola Olaf, las empanadas las puedes armar y luego guardarlas en el congelador. Asegúrate de cubrirlas bien y guardarlas en una bolsa bien sellada para que no se seque la masa que es lo que casi siempre pasa cuando se congelan. Al sacarlas del congelador descongélalas totalmente antes de freirlas. Hola Diana, Aqui otra Colombiana en el exterior que extrana el sabor de su tierra, Gracias Mil por tus videos y tu pagina, la verdad que tu lo haces ver todo tan facil, que hoy mismo se me antojaron las empanadas con el aji verde, Que delicia, Sigue adelante con tu labor, y lo mejor es que se ve que la disfrutas al maximo en la forma como cocinas, Una pregunta, tienes la receta de las Almohabanas, yo me muero por ellas, pero lo he intentado y nunca me salen bien. Te lo agradeceria mucho. Que Dios te bendiga. Lucia W.
Hi sugarrush, Thank you so much for making the recipes! I will be posting the recipe for the chicharrones soon (I hope), I just haven't had time to go to the store to buy it since it's about an hour away from my house. But stay tuned because I will be posting it eventually. I live in Central New York and my best friend adopted 4 of the most amazing children from California a few years ago. This past Spring, her oldest daughter celebrated her Quinceneara and one of her sons mentioned that he wished they could've had empanadas to mark the celebration. Empanadas are not commonly found(or known)in this area and my best friend's palette does not expand much beyond her Irish roots. Every year her family and my family join together before Christmas to celebrate over a meal. It is usually something wonderful her husband, who is Indian, magically creates. But this year, I couldn't forget what her son had said and so, we decided to celebrate her children's Mexican heritage by cooking foods they have missed greatly. I did a search on the internet for an empanada recipe and found your site. My husband and I have just finished making the empanadas, including the Colombian hot sauce and all I can say is tonight is going to be so special for these children! Thank you so much for teaching and sharing your recipe….it is an amazing act of kindness. Keep up the good work and Feliz Navidad!Regards,Jennifer G.
Hi Rebecca, thank you so much for making the recipe!! You can freeze the empanadas after you assemble them but before you fry them. Just make sure you wrap them with plastic wrap and then store them in a resealable bag so air doesn't get it, which is what causes them to dry up and crack.As for the reply button, it could be your browser, maybe you can close it completely and then open it again to see if it's there because I checked Chrome, Firefox, Explorer and even my smartphone and I can see the reply button in all of them. 3 cups water and 3 cups cornmeal doesn't work for me, looks like soup. I've added more cornmeal as I go but the consistency I'm looking for isn't there. I'm using Aunt Jemima white cornmeal enriched de germinated . What could be my problem? I mean it is 3 cups water and 3 cups cornmeal correct? Hi matthew a, the problem is the cornmeal you're using. Even though it has the same name, it needs to be "precooked cornmeal" which is completely different to the Aunt Jemima cornmeal you're using. You can find the correct cornmeal at many Latin grocery stores. They come in different brands like Goya, La Venezolana, Doñarepa, Areparina and Harina P.A.N. being the most popular. You can also buy it online in places like amigofoods.com: http://www.amigofoods.com/harinapan34oz.htmlBut no matter where you get it, make sure it says "precooked" or "precocida" on the label so you know you're getting the correct product. Thank you so much, I was completely frustrated and was giving up. I'll look for the correct corn meal and try again. Whats the serving size? I've had colombian style empanadas made with eggs as well, are you familiar with that recipe? This recipe yields about 20-22 medium sized empanadas. There is no specific recipe for Colombian empanadas that are only made with eggs but some people like to add boiled eggs and even cooked rice as part of their ingredients and it's just a matter of preference. Great Recipe and they turned out great! I added a couple slices of jalapeno on top of the filling before frying to make a few spicy. I really like your technique for folding the mesa with the ziplock over the filling and using the cup/bowl for the seal. This was my 2nd time using a tortilla press and I was able to make one in under a min after about the 10th one. I had some left over filling, but just enough to give to our cats (they loved it also). Thanks for the video, hard work and recipe! I'll be making the tamales tomorrow! I'm going to prepare these then freeze them before frying. Any thoughts on putting frozen empanadas into the fryer? I do it all the time because a whole batch of empanadas is too much for us here at home. I wrap each one individually with plastic wrap and then store them in the freezer inside a resealable bag. Then I take them out of the freezer and fry them directly in the deep fryer. They take a bit longer to be done, about 10 minutes each but they come out super nice and crispy. Don't thaw them out before frying them because they dough will get dry and then crack. Will stone ground corn meal work. Unfortunately, no because it needs to be pre-cooked and finely ground.